AFTER calling on the State Government for funding for the Fitzroy Development Road, local MPs have been left disappointed. The notorious "Beef Road” between Dingo and Nebo has had serious and near-fatal accidents in recent months. 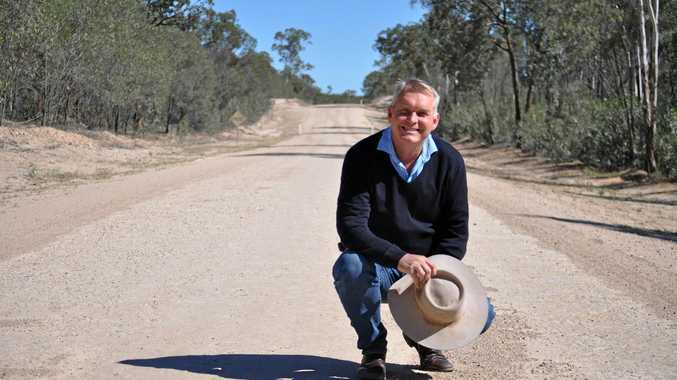 Member for Gregory, Lachlan Millar, was extremely disappointed the road was forgotten by the State Government in the 2018-19 Budget. "It's no surprise, as there is no new road funding for Central Queensland or Central West Queensland,” he said. "The Fitzroy Development Road needs to be upgraded. It needs to be made safer for everyone who uses it, as does the Bauhinia Downs- Dauringa Rd, the Springsure- Tambo Rd, the Alpha-Tambo road and the Jericho-Blackall Rd. Mr Millar said the Budget backed Brisbane but did nothing to support those in rural Queensland, with no new health, school, road or agriculture funding announced. "The budget provided over $668 million for capital works for Queensland schools, but not one cent is going to any schools in Central and Western Queensland,” he said. "The State Government has spent $195 million on schools in Brisbane, and all Central and Western Queensland get is just over $3 million, for Yeppoon, North Rockhampton and Moranbah State Schools. "There's nothing for the Central Highlands, nothing for Western Queensland. "Rural Queensland is also crying out for better, local health services. "There has been no new money for services for the Central Highlands and the Central West, that's no new money for dialysis chairs, no new money for beds in our hospitals, no new money for local health services. Mr Millar said, of the $53.3 million to upgrade health infrastructure, Blackall Hospital was the only winner, receiving only $1 million of a budgeted $17 million upgrade. "To top it all off, the State Government is introducing five new taxes, all of which go to fund projects in Brisbane,” he said. ROUND 1 and Round 2 of the cluster fencing program is currently being rolled out, however vital connecting fences are needed. Member for Gregory, Lachlan Millar said cluster fencing had been a game changer for Western Queensland graziers. "This program has helped restore industry confidence to the region - it's bringing people back to towns like Longreach, Blackall, Isisford and Muttaburra and providing job opportunities for our young people,” Mr Millar said. "If fully funded, the cluster fencing program in Western Queensland will bring one million sheep back to the region, providing a benefit of $3.76 per year for every $1 of government expenditure not only for graziers, but for small businesses in town. "But sadly, the State Government has ignored Western Queensland graziers, only delivering $1.3 million a year.